Why distribute Presta Marine Products? Presta's complete line of marine detailing and refinishing products offer outstanding performance at a profitable margin. Our innovative marine buffing compounds mechanically cut instead of chemically hide. That means that scratches, swirls and defects are removed, permanently. Unlike competitive products that contain fillers and silicone, Presta's marine buffing compounds actually flatten out the clear coat for a flat, flawless finish that lasts. 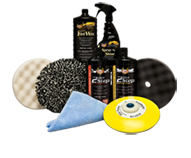 Our compounds and polishes can be used on fiberglass, gelcoats and painted surfaces. That means no dieback and less costly rework. And, because all of our compounds are water-based, they are much easier to clean up, saving time and money. We also offer a wide selection of detailing products for boats, dinghies, surf boards, paddleboards and other watercraft. From boat washes and waxes that offer protection from the elements, to polishes and specialty cleaners for any surface to make watercraft delivery ready, Presta Marine Products are the perfect extension to your business.